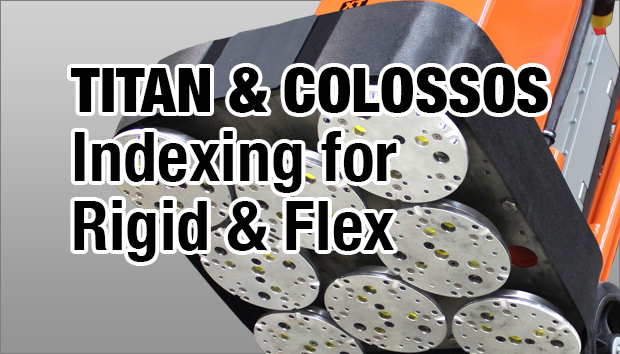 Our new patent pending ULTRA-FLEX Plug ‘N Go Tooling System is a major advancement in tooling design. The challenge was to develop a system that would allow WerkMaster machines to not only flatten a floor, but to also follow a very wavy, uneven floor using the same tools and drive plates on all floor surfaces. The result was an ingenious system that uses various hardness rubber grommets, bumpers and INDEXING. No need to add heavy weights, simply increase or reduce point pressure by easily adding or removing Plug ‘N Go segments. You can vary the desired flexibility allowing you to flatten or follow the floor better than any planetary grinder or hardwood belt sander. How wavy? Remove deep birdbaths or fishbowls up to ¾ inch deep. Grind and polish around drains. Plug ‘N Go technology also eliminates the frustration and pain of dealing with lippage, expansion joints, large cracks, and curled wood floors or decks. Plug ‘N Go significantly improves performance, production and results on polished concrete, wood floors and decks, terrazzo, stone, marble, granite, travertine, and limestone floors, exposed aggregate and spalled concrete. 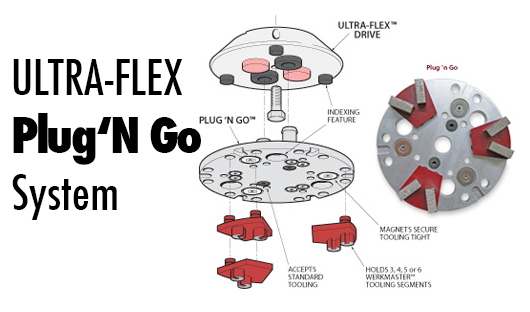 Use the Plug ‘N Go tooling system on carports, driveways, basements, garages, pool areas; and on residential, commercial, and industrial sites. When you need to do surface preparation, no planetary or direct drive grinder can outperform a WerkMaster for removing epoxy, cutback carpet glue, paint, VCT tile glue, thin set, mastic, overlays, micro toppings or prepping anvil top concrete.